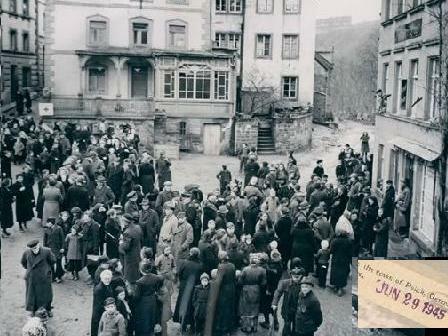 In the 1945 wire service photos above, townsfolk of the small Rhineland town of Polch are assembled by US occupiers in search of “hidden food supplies and fire arms.” In Berlin, bombed out families built shanty towns; Germans root around trash to find food and stand in line for anything they can get. 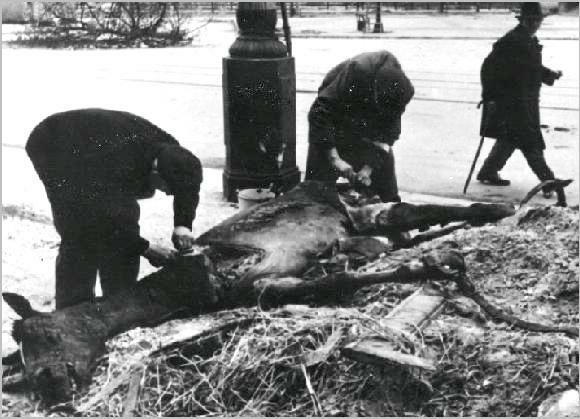 Germans carve meat from a dead horse in Berlin and raid a US rubbish bin in Frankfurt. Collecting “wood from the forests” was not easy for widows with children or crippled elderly people who lost their homes to bombing and were left to live on a starvation diet with no transportation system, no money, and sometimes, no will to live. 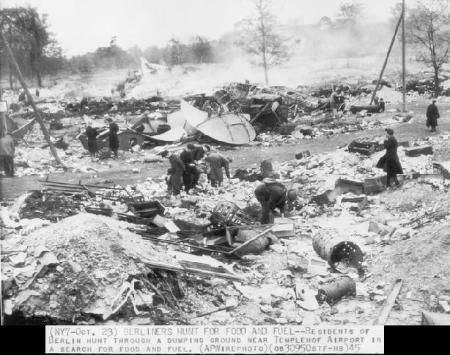 In hundreds of bombed out cities, civilians were living in cellars, old air raid shelters or bunkers without heat, electricity, gas, or running water amid rubble with the everpresent stench of death, for bodies and body parts continually surfaced. Towns across western Germany were swarming with homeless refugees, adding to the misery. People ate whatever they could find, even rodents. Cabbage soup and potatoes were the only diet for most. After several months, a 1,500-calorie ration was allowed by the occupiers which worked out to 5 1/2 slices of bread, 3 medium-size potatoes, 3 tablespoons of oatmeal or other cereal, 1 teaspoon of fat, and 1 teaspoon of sugar daily. Of the total 1,500 calories allowed, 1,200 were in bread and potatoes. Occasionally, a piece of meat or fish “one half the size of an egg” and 3 tablespoons of vegetables other than potatoes was authorized. There was no economy and no stores operating. The Americans took over industries such as coal mines, hiring whoever they could find to work for nothing more than the hope of a noon meal, which most took home to their families. 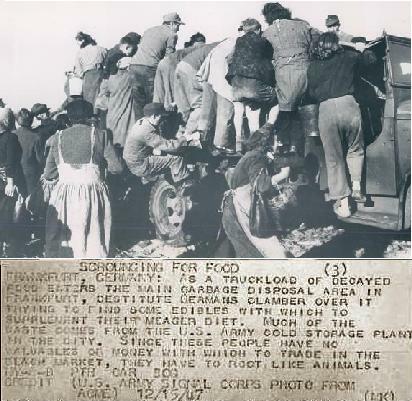 Strict orders were given to U.S. military personnel and their wives to destroy or render inedible their own leftover food so it could not be eaten by German civilians, ostensibly so they would not get used to having more to eat. 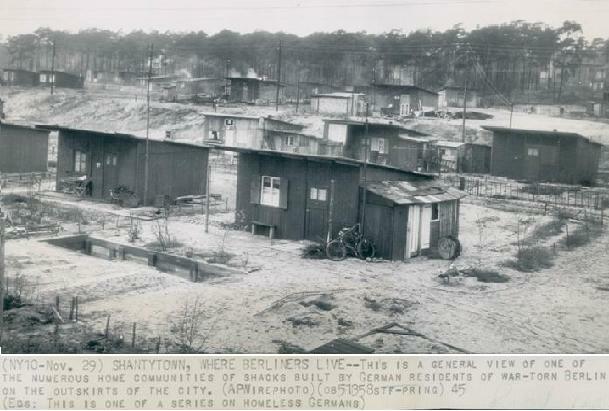 These severe Allied “re-education” programs instituted to “detoxify” the German people compounded the emergency. Among the harshest was Military Government Law No.8 which prohibited any former NS party member (which applied to millions of intelligent, educated German professionals) to work at any vocation except as common laborer. Even in areas with a severe shortage of medical personnel, German doctors and nurses were often dismissed from their jobs due to their political past, resulting in a loss of medical help for thousands at a time when it was desperately needed. This resulted in even more needless loss of life among civilians. 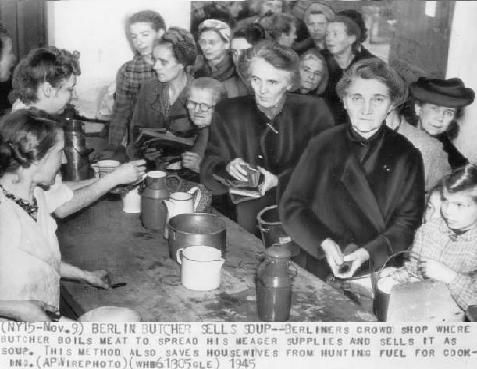 While the American occupiers were forcing women to bury the dead dug out of the rubble and view staged exhibits of German “war crimes,” they calculated that a supply of one egg per person per month, a pint of milk per week for each child under ten and a half pound of butter per month per family was adequate nourishment. Initially, all schools remained closed. Once a plan was formulated to “detoxify” the German mind and “destroy the German will to wage war” in the young, schools were reopened, usually under the charge of left-leaning socialists. The teaching of any German history was strictly forbidden. By the spring of 1946, the official rations allowed to civilians had fallen to 1,275 calories, although some areas were probably not receiving consumer rations of much more than 700 calories per day. These allotments were well below the minimum necessary to maintain health and the capacity for productive labor. But chemicals were apparently not in short supply: Civilians were routinely dusted with DDT to prevent typhus. Eisenhower’s policy of denazification continued to be the priority. During the first wave of re-education in Allied occupied areas, revenge reigned. Adults residing in the US occupied zone were separated as major offenders, offenders, lesser offenders, followers, and free persons. All public officials were removed from office: 150,000 from public and semi-public office, 73,000 from business positions. They received neither salary nor pension and were permitted only to pursue menial work. In April 1946, a special law transferred the denazification process to 545 civilian courts set up under German administration and supervised by puppet German ministers who were politically leftist or communist. This lasted until the onset of the Cold War. A strict curfew was imposed, all cameras and weapons were required to be turned into authorities, and even gossip was strictly censored. In Military court, people were dealt with harshly. One defendant got 20 years in prison for “spreading rumors prejudicial to Allied interests.” Another man was sentenced for “holding a public meeting” after he’d hired a carpenter to repair his house and a crowd had gathered to watch the work. There were also non-fraternization cases against civilians, usually German women that GIs were caught spending time with. There were 3.5 million indictments and 950,000 proceedings. The three and a half years of re-education lasted until 1948. During this time, 1,549 persons were classified as “major offenders,” 21,600 as “offenders,” 104,000 as “lesser offenders,” and 475,000 as “followers.” Around 9,000 received a prison sentence; 500,000 were fined and 25,000 were dispossessed. Around 180,000 were arrested and detained. By early 1947, the Allies held 90,000 former NS in detention, some for years, in internment camps. The French and English pursued denazification less fervently, while the Soviets used the process to get rid of “class enemies.” In the East, the Soviets (who still had a “ war will”) soon brought concentration camps back into operation and filled them with alleged NS and all others who didn’t cooperate with Communists. In the Russian zone, 30,000 people were tried for war crimes; 200,000 alleged NS were removed from positions in administration and business; 20,000 teachers (half of all) were dismissed; and 500 were sentenced to death and executed.